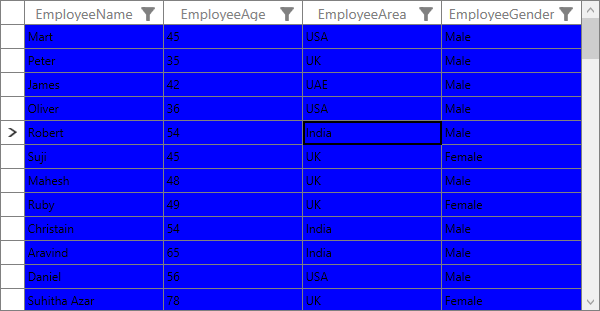 How to show the selection of row/cell when setting the background for SfDataGrid GridCell? Row/Cell selection border is behind the GridCell content. So when you apply the background for GridCell, the selection is not displayed in UI. The following code example shows you how to set the GridCell style. 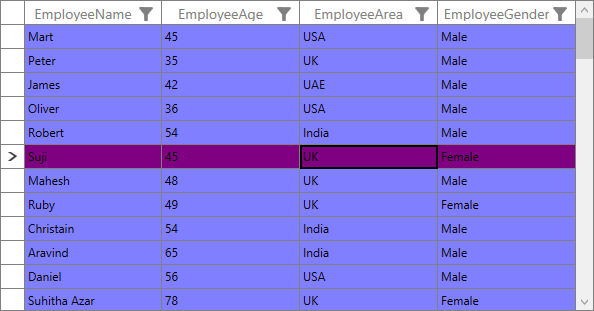 In the following screenshot, the selection is set in the 5th row, but it is not displayed in View with the selection border in the Cell Content presenter. You can overcome this problem by reducing the Opacity for the brush that you set to the GridCell background. The following code example shows you how to set the Opacity to GridCell. The following screenshot shows you the selection of row after applying background for GridCell also.